Ring News 24Boxing News Breaking Boxing NewsIs Vasyl Lomachenko pound for pound number one? 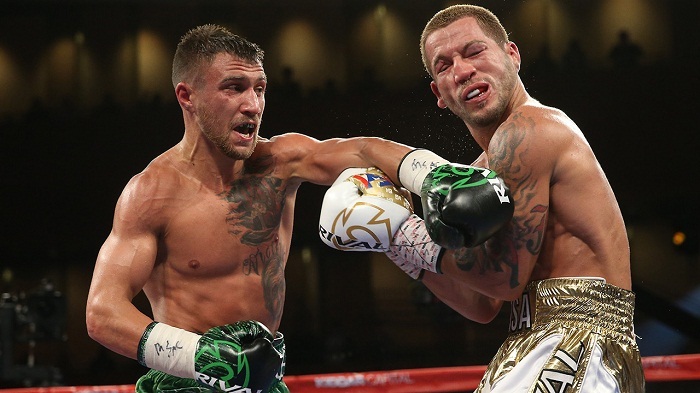 Is Vasyl Lomachenko pound for pound number one? After his classy performance in dismantling awkward Cuban Guillermo Rigondeaux, in what many expected to be a close scrap, Vasyl Lomachenko’s stock has never been higher. Undoubtedly the biggest win of his short but impressive professional career to date, the Ukrainian made the former undefeated two-time Olympic gold medallist quit after the sixth round, after thoroughly outclassing him. With a modest 10-1 (8 KO) record, Lomachenko may not seem to have a record that stacks up against his pound for pound rivals. However when you consider he became a world champion in only his third fight, and had become a two-weight world champion by his seventh, it is clear he has packed an awful lot into his 11 career fights. Perhaps owning one of the greatest amateur records in the history of the sport, with 396 wins to one loss (a loss he avenged twice against Albert Selimov) his pedigree cannot be denied. His two Olympic Golds at the Beijing and London games highlight this, as well as his two Golds at the World Championships in 2009 and 2011. After turning professional, he challenged for a world title in only his second bout, with many expecting him to walk through the experienced but beatable Orlando Salido. It came as a shock to many in the sport when Lomachenko lost a split decision to the Mexican, who had 12 losses on his record. Citing his failure to listen to his corners instructions as the reason he came up short. However, he bounced back in his next fight taking the WBO Featherweight belt off Gary Russell Jr, going on to defend the belt four times. He then stepped up a weight, dethroning WBO Super Featherweight Champ Roman Martinez with a fifth round KO, before forcing fearsome puncher Nicholas Walters to quit in his first defence. Two more defences followed and then his scintillating performance against Rigondeaux. With ten of his 11 fights being for a world title, his performances have often been breath-taking, rarely losing a round. His style is very well rounded, with an impeccable defence, fast hands, knockout power, and a granite chin there doesn’t seem to be any weaknesses, and as proved in his only career loss, the only person who can beat him is himself. So, the question remains, is he the best pound for pound fighter in the world? Time will tell, but as we go into 2018, one things for sure, not many boxers will fancy their chances against Vasyl Lomachenko.